We've included these beaches for you: Four Mile Beach and Trinity Beach. Step out of the city life by going to Safaris and Palm Cove Beach. Venture out of the city with trips to Cape Tribulation (Myall Beach, Cape Tribulation Beach, & more), Thornton Beach (in Thornton Beach) and Kayaking & Canoeing (in Palm Cove). Spend the 14th (Sat) among aquatic life with a scuba or snorkeling tour. There's much more to do: identify plant and animal life at Hartley's Crocodile Adventures, get outside with Horses in Port, look for gifts at With Sugar, and get great views at Flagstaff Hill Lookout. To see traveler tips, ratings, photos, and other tourist information, use the Port Douglas trip planner . London, UK to Port Douglas is an approximately 26-hour combination of flight and shuttle. You can also do a combination of flight, car, and ferry. Due to the time zone difference, you'll lose 10 hours traveling from London to Port Douglas. Prepare for somewhat warmer weather when traveling from London in September: high temperatures in Port Douglas hover around 33°C and lows are around 22°C. Finish your sightseeing early on the 20th (Fri) to allow enough time to travel to Brisbane. We've included these beaches for you: Surfers Paradise Beach and Burleigh Heads Beach. Step out of the city life by going to Lone Pine Koala Sanctuary and Burleigh Head National Park. Get out of town with these interesting Brisbane side-trips: Chenrezig Institute (in Eudlo), Caloundra Lighthouses (in Kings Beach) and Marina Mirage (in Main Beach). There's lots more to do: enjoy the sand and surf at Mooloolaba Beach, enjoy the sea views from Fingal Head Lighthouse, stroll through Dicky Beach, and steep yourself in history at Boggo Road Gaol. 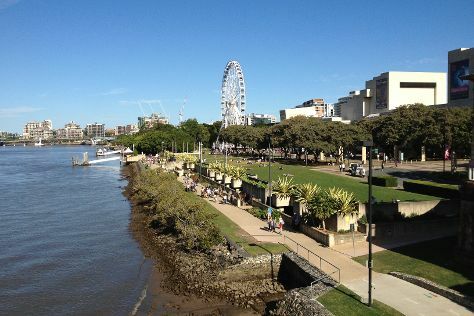 To see maps, ratings, reviews, and more tourist information, refer to the Brisbane trip tool . Do a combination of shuttle and flight from Port Douglas to Brisbane in 6 hours. Alternatively, you can do a combination of shuttle, flight, and bus; or drive. Prepare for a bit cooler weather when traveling from Port Douglas in September: high temperatures in Brisbane hover around 28°C and lows are around 15°C. Wrap up your sightseeing on the 27th (Fri) early enough to travel back home.